Andrew Joseph Cohen is an American radio and television talk show host, producer and writer. 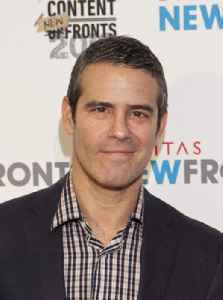 He is the host and executive producer of the Bravo's late night talk show, Watch What Happens Live with Andy Cohen. Cohen also has a pop culture channel on SiriusXM Radio named Radio Andy. He hosts a two-hour live show with co-host John Hill twice a week. Cohen served as Bravo's Executive Vice President of Development and Talent until 2013. He was responsible for creating original content, developing innovative formats and identifying new talent. Cohen also served as Executive Producer on Emmy and James Beard award–winning reality cooking competition television show, Top Chef. He continues to serve as an executive producer of the Real Housewives franchise, host of Watch What Happens Live on Bravo, host of Andy Cohen Live on SiriusXM channel 102, and hosted the television dating show, Love Connection. Ripa, 48, explained to Andy Cohen why her husband is giving her baby fever.